As I've mentioned before, KD2CHE and I belong to a local transmitter hunting group. We get together one or two times a month. One member will hide the box and give us a general area, which is usually a radius from a point (i.e. 2 miles from the intersection of routes 1 and 2 in Anytown, NY). We are the only ones without doppler equipment, yet we almost always find the transmitter. Here's some pointers for those of you that enjoy a bunny hunt every now and then, but may not think you can participate without sophisticated direction-finding equipment, or for those of you with dopplers that want to refine your techniques. Once the transmitter is activated, KD2CHE drives slowly around the building at the starting point, stopping when the transmitter stops, and starting up again when it comes back (the one we use is usually 30 seconds on / 30 seconds off). I mark the points in our loop where the signal was strongest and weakest, drawing a line with an arrow to get our initial vector. Then we navigate in that direction, using Google Maps as a guide. As the signal changes I mark the observed strength on the map. When we reach the point where the signal strength goes back down, we determine the high point, and KD2CHE drives as close to perpendicular to the original route as she can. During this process, the RF gain control on the Kenwood comes in handy. The box puts out a full 5 Watts, so as you get close to it, an un-attenuated receiver becomes useless. For the signal readings with the RF gain all the way down, I write an 'A' in front of the s-meter reading on the map. As the strength goes up again, we keep an eye on the 2 HTs. When we're within 1 or 2 blocks, one or both of them will become active. The third harmonic will usually not work until you are almost on top of the transmitter, which comes in handy. This is when we start looking for a good spot. In many cases there will be a public park, or area of some sort nearby, and the rest of the hunt is done on foot with the HTs, and the flash-lite if necessary. Body shielding will get you a direction to walk in. Hold a radio that is getting a weak signal (the IC-T90A has a fixed-level attenuator I can activate) close in to your chest and slowly turn around, and make note again of the weak and strong points in the circle. Keep in mind though that sometimes, a good hider will put the box in a location that creates reflections and ghosts. Sometimes you just need to use logic, or in the case of our last hunt, KD2CHE found the box simply by looking, while everyone else was wandering around the woods with Yagis and other fancy equipment. Of course it helps to know the area, and to have some insight into where people like to hide things. One of our hiders frequently hides in places he discovers while hiking. Another likes to hide in very unique, and sometimes questionable places. Once or twice we've had to explain to the authorities what we were doing. I'm convinced that a doppler might enhance our abilities, but I'm afraid of relying on it too much. We actually have one, but it needs some work. We'll see. Welcome to RadioKitGuide.com. Some time ago, I attempted to research sources for kits on the Internet, only to find out that there wasn't a one-stop-website for Ham Radio kit suppliers. QRP operation, but a few are full-featured professional transceivers (Elecraft, DZ). On the beginners side there are a few sources that stand out: Hendricks has a great assortment of kits, including some SSB QRP equipment. QRPme offers the inexpensive, easy-to-build tuna-can products, and I would like to make special mention of the Four State QRP Group NS-40 which has the coils etched right into the PC board! What a great idea! I've covered transmitters, transceivers, and some receivers here. Some accessories are mentioned in the source descriptions. Revised 2/18/2013 Changes in Hendricks, YouKits, Tony Parks. Added CR KITS, and BreadBoard Radio. Revised 12/14/2013 added quite a few new vendors! Marked in the list below with a "*" Added list of vendors (to be linked at a later date), and alphabetized the whole guide. -ag6bd (eBay seller). http://www.ebay.com/usr/ag6bd This Thai eBay seller is carrying a large variety of receivers, transceivers and accessories. As of this writing there are only 7 items listed, but this varies up and down during the month. It would be impossible to list all of the items here, as many are not listed at the moment, and unfortunately there does seem to be a small language barrier. One item of interest is the SW20+ which appears to be a re-make of the SW20+ from Small Wonder Labs. As I said, not everything is available all of the time, so check the completed listings for an idea of what might be coming, and check back often with ag6bd. 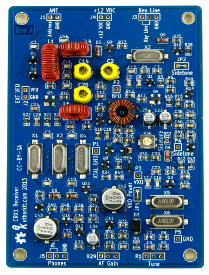 · -NEW- SW20+ Superhet CW transceiver. This appears to be the same radio formerly sold by Small Wonder Labs, as a board-only kit, with a 10 Watt audio amplifier along for the ride. Check out the information on the SW20+ for more info. $55.00 shipped to the USA. · -NEW- CW Receiver kit - VXO for CW. This is a simple VXO CW receiver for the CW portion of the purchased band (the 17 Meter model tunes 18.070-18.080). Easy build. Runs on 12 - 15 Volts. These kits seem to come in different bands depending on stock. This one is $27.00 shipped to the USA. · BITX Kits. I won't list the kits individually because the website is a bit confusing. They seem to have several different options from a basic kit with just the board and specialty components only for $18 to a deluxe complete kit with digital readout for $85 They also seem to be about to release a complete kit with case and all. -BLEKOK QRP by YD1JJJ http://blekokqrp.blogspot.com/ (Indonesian. Use Google Translate) Sells kits on eBay. Click here for availability. If he is out of stock, look at completed items. · The “Splinter” QRPp Receiver / Transmitter. Direct conversion receiver that tunes about 100khz of the 40 meter band. Has bandpass filter with attenuator, 2 stage audio amp with RC filtering. Drives standard stereo headphones. Also receives SSB. The crystal controlled Transmitter puts out about 450 mW. Has SPOT function. Two position crystal switch. One crystal is soldered in (7030kHz) and one socket for extras. Sidetone oscillator, and VXO (about 3kHz). Built in key, or jack for external. Complete kit: $54.95, with free shipping. · The “Sawdust” Regen Receiver. Tunes about 75 kHz of the 40 meter band. CW, and SSB. Will drive headphones or small speaker. Fixed regen. Can also function as a code practice oscillator. Easy to build. Complete kit: $24.95 with free shipping. -Cycle 24 Kits (eBay). http://www.ebay.com/usr/cycle24kits This eBay seller carries a couple of kits, and says that more are on the way. One receiver-converter kit that looks interesting. -DX Kits (UK). http://www.dxkits.com/g6lbq-kits DX Kits carries a few kits and boards, mostly for the G6LBQ MK2 Multiband transceiver project. They also sell quite a few accessories and components. · -NEW- GL6LBQ MK2 kits. There are 3 kits that make up the project (with a 4th on the way). Currently available are the kits for the BitX Multiband SSB Exciter (£79.95 + S&H), The linear board (£19.99 + S&H), and the VFO (£84.50 + S&H with Si570 pre mounted). Coming soon is the band pass filter kit, which will cover all 9 Amateur Radio bands. Any of these components can be used individually for your own homebrew projects. · Sienna Transceiver Kit. This is a high end, full-featured transceiver with many options. The Sienna can be a full-control stand-alone rig, or a computer-controlled-only rig. Available in 10 and 100 watt version. Kits start at $2797 + S&H for the computer-only 10 watt model. -Kits By EA3GCY http://www.qsl.net/ea3gcy/index.html. This is the home of the ILER transceiver kits, as well as the ILER DDS-VFO. Shipped worldwide from Spain. All prices in Euros. · K3 Modular Kit. The K3 is Elecraft’s top of the line. Available in 10 and 100 watt versions and with a multitude of options. The modular kit comes with mostly pre-assembled boards that need to be plugged in. The K3 kit starts at $1599.95 and increases depending on what options you choose. · A nice collection of kits including keys, keyers, and clocks. · Emtech is currently out of stock on their NW-series radios. Check back. In the meantime, they have the excellent ZM-2 QRP tuner kit. -Etherkit. http://www.etherkit.com/ Etherkit is run by Jason Milldrum, NT7S, who prides himself in keeping his products completely open-source. He currently offers 1 each receiver and transmitter kit, but is working on the impressive CC1 open source transceiver (http://tinyurl.com/etherkitcc1) . -Free Time Goods (eBay). http://stores.ebay.com/FREE-TIME-GOODS This eBay seller carries WSPR receiver kits, available for the 20 and 30 Meter bands. -The Ham QRP DIY Kit Shack on AliExpress. http://www.aliexpress.com/store/group/HAM-QRP-DIY-Kit/331885_251085312.html. An interesting new find. They sell 3 QRP kits, and various accessories. All kits come with crystals for 7023 kHz, but can be changed by the builder for any other 40 Meter crystal. Pixie requres one crystal, Frog needs two, and the Super RockMite needs three, all the same freq. I haven't purchased from them yet, but I am planning on trying out some of these. I posted a question on the store page, and got an answer less than 5 minutes later! · Hamtronics offers a variety of VHF and UHF receiver and exciter kits as well as many other interesting items. -Hendricks QRP Kits http://www.qrpkits.com/ One of the best selections of Ham Radio related kits on the Internet. Quite a few accessories too! -HF Projects. http://www.hfprojectsyahoo.com/ HF Projects carries the HF Packer amp kit for boosting the power of your QRP projects. Includes all parts, and a predrilled case and heat sink. There are accessories for modifying the amp for other uses, and you can purchase the relay controlled LPF from the Packer amp separately. -Hobby PCB. http://www.hobbypcb.com/amateur-radio Hobby PCB sells an amplifier kit called the HardRock 50. This is an evolving project, but produces a very nice 50 Watt amp. They have an active Yahoo Group for help too. They also have a 5 Watt drive board to use the HardRock with low power (.5 Watt) radios, and they carry the boards for the WA2EUJ DSP-610 project. -HSC (Halted Specialties Company). http://www.halted.com/ HSC is a great source for components, but they also sell a Pixie II Kit w/o crystals. -JUMA. http://www.jumaradio.com/juma/ All prices are in EUROS € I have emailed JUMA asking them for status on their kits, as nothing seems to be available at the moment. They replied explaining that they are transferring logistics to a new company and hope to have kits by the end of the year. - K5BCQ & K5JHF Kits http://www.qsl.net/k5bcq/Kits/Kits.html These Hams from the Austin QRP Club offer a page of accessories and support kits. The most interesting thing on this page is the SDR2GO Kit. This is a replacement for the computer and soundcard in a standard I/Q SDR setup. You are meant to use this with an existing SDR board (like Tony Parks' RXTX Ensemble) to create a complete standalone SDR. They even have a graphics display kit option. There is also a 20 Watt amp, an Si570 Controller with display, a programmable keyer, and much more. Very reasonable too! · Several inexpensive kits for the radio hobbyist, mostly supplied as a "bag of parts" with a schematic. The owner of Kanga US has temporarily closed shop, as he is recovering from a stroke. From the comments on his post on the main page, it looks like he is planning to reopen soon. -Kenneke CommunicationsLLC http://www.kenneke.com/index.html. Kenneke Communications, LLC offers Unique Electronic and Hobbyist Plans, Electronics Items, Kits, Surplus Radio Electronics Amateur Radio Kits, AM/FM Low Power Broadcasting (FCC Part-15) Supplies. They have another version of the Pixie II Transceiver kit, as well as some other interesting radio-related kits. Website is back up but it does not allow you to order anything. · Pixie II CW Transceiver Kit. A very simple and inexpensive transceiver kit that can be built to operate on any one band from 10 to 160 Meters. Several crystals also available as well as a 7MHz VFO kit, a connector kit, and more. $29.95 including shipping in the USA. -Kit Radio Company http://www.kitradio.co.uk/ KRC Offers mostly Shortwave receivers, but also has an 80 Meter direct conversion receiver, as well as some accessories. Prices are in British Pounds. Not sure about shipping costs outside of the UK. -Kits and Parts dot com. http://www.kitsandparts.com/index.php K&P sells a line of accessory kits (filters, amps, etc) as well as parts for your own projects. They have a huge selection of ferrite toroids. They currently sell one transceiver kit. -MFJ http://www.mfjenterprises.com/ MFJ has been a source for all things Ham Radio for years. They have a couple of kits in the catalog, plus they own Vectronics, also listed in this guide. -Mini Kits (AUS). http://www.minikits.com.au/ Lots of accessories in kit form from down under. Bandpass filters, amps, and much more. -North Country Radio. http://www.northcountryradio.com/index.htm NCR is a source for many amateur related kits. Too much to list here, but they have several ATV related items. -Oak Hills Research. http://www.ohr.com/ Founded by Doug DeMaw W1FB, the godfather of QRP. One transceiver kit, and several accessories. -OpenQRP. http://openqrp.com This is the US home of the Open QRP project by K1EL. -OZ QRP (Australia) http://www.ozqrp.com/index.html. Owned by Leon Williams (VK2DOB). Offers the MST (Minimalist Sideband Transceiver) as “short-form” kits (PCB plus specialized and hard to get parts). Ships worldwide. Prices in Australian Dollars. -Radio-Kits.com.uk. http://www.radio-kits.co.uk/ These folks sell a couple of radio kits (listed below), and a few neat accessories including a CW kit that will work with many SSB-only radios. All prices in British Pounds. -Radi0shop (eBay store). http://stores.ebay.com/radi0shop This eBay store is selling a couple versions of the Pixie II transceiver. They currently have 80 meter, and 40 meter versions. Looks like a very simple build. $39.00 free shipping. -Rainbow Kits. http://www.rainbowkits.com/index.html Rainbow has a large selection of kits for the tinkerer, and one receiver kit for amateur radio, and several accessories. -Ramsey Electronics. http://www.ramseyelectronics.com/ Ramsey has so many kits that it makes it hard to list them all. Several transmitters and receivers for Ham Radio, a SW receiver, and much more. -Small Wonder Labs. http://www.smallwonderlabs.com/ Small Wonder Labs, home of the RockMite transceiver for so many years, has closed for business. QRPME.com, the tuna can people will be taking over official production of the famous RockMite. They are listed elsewhere in this guide. There are a couple of un-official sources for SWL designs too. The Ham QRP DIY Shack listed in this guide is offering a different updated version of the RockMite, and AG6BD (eBay seller) is selling a new version of the retired SW20 transceiver. -Ten-Tec. http://www.tentec.com/categories/Products-by-Area-of-Interest/Kit-Building/ Ten-Tec has 8 Radio kits available. · -DISCONTINUED- Digital Readout Superhet Receiver 1254. 100 Khz to 20 Mhz coverage. Several option available to improve performance from 3rd parties. Discontinued due to parts availablility. -Tony Parks, KB9YIG. http://fivedash.com/ Tony seems to have partnered up with someone to get kits out faster. The new website lists 4 kits available currently. Although this is not kit-related, Tony is offering an assembled version of the Softrock RX Ensemble II for $92.00. Tony has also added custom cases for the Ensemble receiver, and transceiver right on the site. -Unified Microsystems. http://www.unifiedmicro.com/ Unified Micro sells a nice line of accessories including a couple of kits. Of special note is the SCI-6 sound card interface kit, for operating in digital modes. -Vectronics (MFJ) http://www.vectronics.com/Categories.php?sec=209. Vectronics has a large selection of Ham Radio kits and accessories. Some of their products are similar, or even identical to their parent company's products (MFJ). · The Lydford SSB Phone Transceiver. Built for any single band 20 – 80m inclusive – your choice when you receive the kit! The RX has a doubled tuned RF filter that feeds a SA602 first mixer, which is followed by an IF amplifier prior to the 6 MHz five crystal ladder IF filter. This is followed by another SA602 for the CIO/product detector, and then two stages of audio amplification. Main tuning is by a PolyVaricon, with a potentiometer controlled varactor diode for fine adjustment. To help with the wide range of LO frequencies needed for the available bands, the kit contains a digital divider that is driven by the VFO for the lower frequency bands. The main PCB is a double sided 100 x 160 mm; the kit includes all front panel parts and a plain single sided PCB that you can lay out to your own design of front panel. £79 + S&H. · -NEW- UHFSDR Transceiver. The UHFSDR is a Software Defined Transceiver covering the 1.75 MHz to 700 MHz frequency range. A Si570 is used for frequency control. Two LVPECL 4 GHz max.flip flops produce I and Q LO signals at 1/2 the Si570 frequency. A pair of 1-1000MHz Double Balanced Mixers are used to convert signals to and from base band. A receiver pre-amp (2dB noise figure) and a transmit pre-amp(50mW max output) are provided as well as antennal switching plus provision for separate receive and transmit connections. There is a Yahoo Group for support. The board is $10 shipped to the USA, and a mini kit is available with some components for $40 shipped to the USA. There is an email contact listed for complete kits, but no price posted. -Wilderness Radio. http://www.fix.net/~jparker/wild.html I emailed Bob to get status on the Wilderness Radio lineup, and was told that the SST and Sierra have been discontinued for parts availablility. The 40a is still available as well as the KC1 and Buzznot kits. · --DISCONTINUED-- Sierra. The Sierra is the only compact, low-current, multiband transceiver kit available. Designed by N6KR and extensively field-tested by the NorCal QRP Club, the Sierra has been completely upgraded for Wilderness Radio--including a painted and silk-screened enclosure and improved performance on both transmit and receive. Uses plug-in band modules for 80, 40, 30, 20, 17 and 15 meters. 1.5 to 3 watts depending on band. LCD display. Starts at $245 + S&H with 1 band module. -Xtal Set Society / Midnight Science. http://www.midnightscience.com/kits.html these folks have an nice assortment of crystal and basic AM and SW kits, but also have a few kits for hams, like a dummy load and attentuators. -YouKits http://youkits.com/. YouKits also has the well-known HB-1B QRP rig (assembled) and some accessories. -Yoyodyne Consulting. http://www.yoyodyneconsulting.ca/ Yoyodyne sells the SR63ng, a clone of the retired SoftRock 6.3 SDR transceiver, for specific application. · -NEW- SR63ng SDR Transceiver board. The SR63ng is a clone of the older 6.3 version of Tony Parks' Softrock transceiver. This is not meant to compete with Tony's newer products, but is available for use with the MOBO, a board that turns a 6.3 softrock into an all band SDR transceiver. $CAN 66.50 shipped to the USA or Canada. -Zao.jp. http://zao.jp/radio/order/ Zao has one kit currently available. He is also the source for the pre-built Soft66 SDR radios (currently selling new version LC4) which is one of the lowest-priced pre-built SDR receivers on the market. Getting it running is a challenge I hear, but performs well for the money once you do.